(JASPER CO.) The Greater Bluffton Chamberrecently formed the Greater Bluffton Chamber Community Fund, managed by the Community Foundation of the Lowcountry, to help with scholarships, apprenticeships, special projects and small business assistance for the greater community. The first donation to the fund was made by Peacock AutomotivePresident & CEO Warner Peacock. 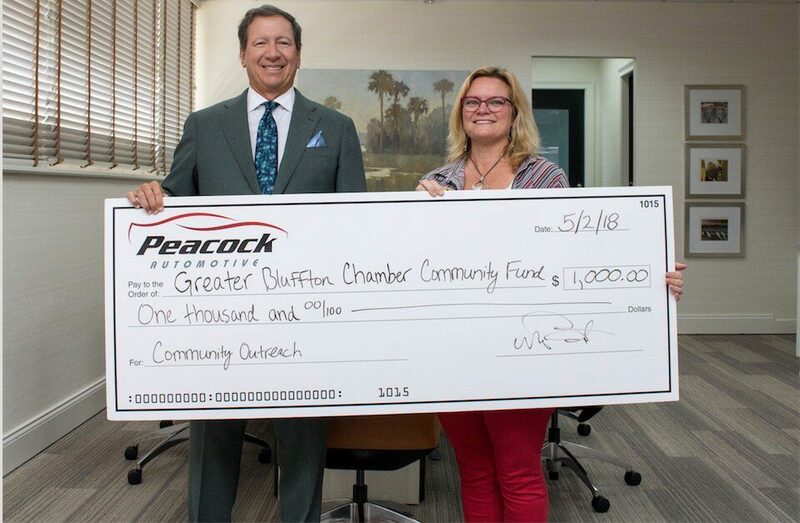 “We’ve supported the Greater Bluffton Chamberand CVB, Inc., since its inception in 2012 and we felt that it was important to give to the fund for its mission and success moving forward,” said Peacock. “The chamber and I truly appreciate the businesses who have supported us and really are grateful for the donation from Peacock Automotive. They have done wonderful things for this community,” said West. Anyone may donate to the Greater Bluffton Chamber Fund. Please contact the Community Foundation of the Lowcountryby visiting its website at www.cf-lowcountry.orgor by calling 843-681-9100. Or, contact the Greater Bluffton Chamber of Commerceat info@blufftonchamberofcommerce.orgor 843-757-1010.